Three Parts to the Prophecy. This book, which bears the title "The Vision of Obadiah," consists of but twenty-one verses, which are devoted to a prophecy against Edom. The prophecy is usually divided into two parts: verses 1-9 and 10-21. In the first section Edom is pictured as sore pressed by foes. She has become "small among the nations," and Yhwh is to bring her down from "the clefts of the rock" where she dwells. Edom is further said to be overrun with thieves; and her own allies are destroying her. 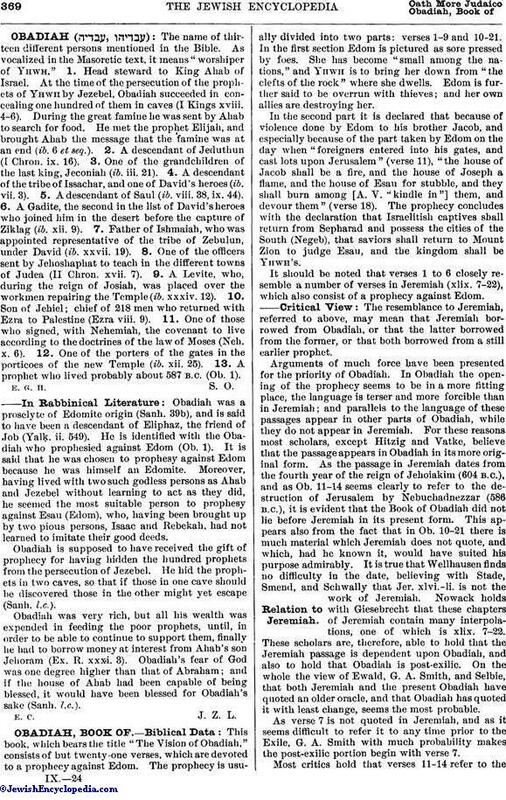 In the second part it is declared that because of violence done by Edom to his brother Jacob, and especially because of the part taken by Edom on the day when "foreigners entered into his gates, and cast lots upon Jerusalem" (verse 11), "the house of Jacob shall be a fire, and the house of Joseph a flame, and the house of Esau for stubble, and they shall burn among [A. V. "kindle in"] them, and devour them" (verse 18). The prophecy concludes with the declaration that Israelitish captives shall return from Sepharad and possess the cities of the South (Negeb), that saviors shall return to Mount Zion to judge Esau, and the kingdom shall be Yhwh's. It should be noted that verses 1 to 6 closely resemble a number of verses in Jeremiah (xlix. 7-22), which also consist of a prophecy against Edom. The resemblance to Jeremiah, referred to above, may mean that Jeremiah borrowed from Obadiah, or that the latter borrowed from the former, or that both borrowed from a still earlier prophet. Arguments of much force have been presented for the priority of Obadiah. In Obadiah the opening of the prophecy seems to be in a more fitting place, the language is terser and more forcible than in Jeremiah; and parallels to the language of these passages appear in other parts of Obadiah, while they do not appear in Jeremiah. For these reasons most scholars, except Hitzig and Vatke, believe that the passage appears in Obadiah in its more original form. As the passage in Jeremiah dates from the fourth year of the reign of Jehoiakim (604 B.C. ), and as Ob. 11-14 seems clearly to refer to the destruction of Jerusalem by Nebuchadnezzar (586 B.C. ), it is evident that the Book of Obadiah did not lie before Jeremiah in its present form. This appears also from the fact that in Ob. 10-21 there is much material which Jeremiah does not quote, and which, had he known it, would have suited his purpose admirably. It is true that Wellhausen finds no difficulty in the date, believing with Stade, Smend, and Schwally that Jer. xlvi.-li. is not the work of Jeremiah. Nowack holds with Giesebrecht that these chapters of Jeremiah contain many interpolations, one of which is xlix. 7-22. These scholars are, therefore, able to hold that the Jeremiah passage is dependent upon Obadiah, and also to hold that Obadiah is post-exilic. On the whole the view of Ewald, G. A. Smith, and Selbie, that both Jeremiah and the present Obadiah have quoted an older oracle, and that Obadiah has quoted it with least change, seems the most probable. As verse 7 is not quoted in Jeremiah, and as it seems difficult to refer it to any time prior to the Exile, G. A. Smith with much probability makes the post-exilic portion begin with verse 7. Most critics hold that verses 11-14 refer to thedestruction of Jerusalem by Nebuchadnezzar. As the Assyrians and Babylonians are not referred to, it is probable that the "nations" who were plundering Edom were Arabic tribes. Winckler (in "Altorientalische Forschungen," ii. 455, and in Schrader, "K. A. T." 3d ed., pp. 294 et seq.) places the episode in the reign of Darius. Wellhausen is probably right in believing that reference is made in verses 1-15 to the same epoch of Edom's history as that referred to in Mal. i. 2-5, and that the inroads of these "nations" were the beginning of the northern movement of the Nabatæans. If this be correct, this part of the prophecy comes from the early post-exilic period. Cheyne ("Encyc. Bibl.") holds that the references to the Negeb in the concluding verses of the prophecy indicate for the latter part of the book a date considerably later than the Exile, after the Edomites had been pushed out into the Negeb and southern Judah. This view, which had been previously expressed by Nowack and has since been adopted independently by Marti, is confirmed by the eschatological character of the contents of verses 16-21. Marti is probably right in regarding these verses as a later appendix to the prophecy. The position of the Edomites would indicate that the verses date from the Greek period; and the approaching conquest of the Idumean Negeb points to a Hasmonean date. There thus appear to be three parts to this short prophecy: (1) a pre-exilic portion, verses 1-6, quoted by Jeremiah and also readapted, with (2) additions, by another Obadiah in the early post-exilic days; and (3) an appendix, which probably dates from Maccabean times. As to the exact date of the pre-exilic portion, it is difficult to speak. Some have dated it as early as the reign of Jehoshaphat; others, in the reign of Joram of Judah. The circumstances appear to be too little known now to enable one to fix a date. Arabs have surged up from central Arabia from time immemorial. The Nabatæan invasion of Edom was probably not the first time that Edom had been overrun with plunderers from that direction. Verses 1-6 probably refer to an earlier experience of a similar character, the circumstances of which can not now be traced. The captivity in Sepharad (verse 20) has occasioned much discussion. In ancient times "Sepharad" was believed to be a name for Spain. The Targum of Onḳelos renders it , i.e., Hispania. Schrader (l.c. 2d ed., p. 445) identifies it with Saparda, a town in Media mentioned in the inscriptions of Sargon. If there was a Jewish colony of captives here, however, nothing is otherwise known of it; nor are any circumstances evident which would render probable the existence at this point of a colony of sufficient importance to be referred to in the terms used by Obadiah. W. R. Smith and many recent writers have identified it with the Saparda which Darius in his inscriptions mentions between Cappadocia and Ionia as though it were, like them, a province. It is mentioned again in an inscription of the thirty-seventh year of the kings Antiochus and Seleucus, i.e., 275 B.C. This region was somewhere in the neighborhood of Phrygia, Galatia, or Bithynia. When it is remembered that Joel (Joel iii. 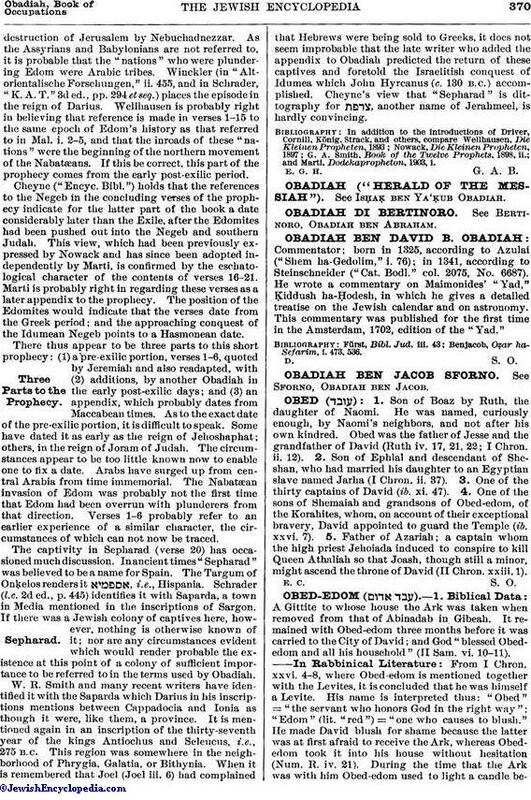 6) had complained that Hebrews were being sold to Greeks, it does not seem improbable that the late writer who added the appendix to Obadiah predicted the return of these captives and foretold the Israelitish conquest of Idumea which John Hyrcanus (c. 130 B.C.) accomplished. Cheyne's view that "Sepharad" is dittography for , another name of Jerahmeel, is hardly convincing. and Marti, Dodekapropheton, 1903, i.